Were living in a digital video world, might as well make it beautiful. iTEC Consultants offers business and home audio and visual installation that brings you convenience and elegance like never before. iTEC Consultants offers audio and visual installation for your home or business. Take control of cable boxes, remote controls and more from just a single location with video distribution. Best of all, everything is integrated to conceal obtrusive wires and keep your space looking refined. The result is a space that's more serene and connected. 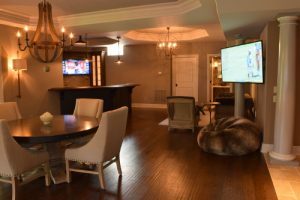 Homeowners use our home automation consultants to ensure that members of the household can watch different programs from multiple locations. Change the channel without ever stepping foot in the room. Businesses can manage programs from a single location and change channels as needed, perfect for sports bars, hotels and offices. Control your television with our complete home audio and visual automation. Complete your house by having your bathroom have audio visual automation. iTEC has a team of dependable professionals delivering a truly custom experience so you can get the most from your technology investment.